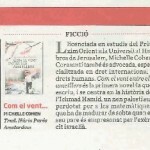 The Almond Tree recommended on Catalan National TV. Video available at: http://www.tv3.cat/3alacarta/#/videos/4877331. Watch the Italian book-trailer from Feltrinelli on YouTube. I loved the way she described each and every character from Amal, Abbas, and Hani to Ahmed and Sara. This is the way a story should be narrated. The preconceived notion that the greatest creations in world literature have almost been achieved in the grim periods of time comes true with Michelle Cohen’s debut, The Almond Tree. Michelle, although is a lesser known novelist unlike other Jewish authors of enormous fame, Imre Kertész or Amos Oz but her literary explorations and rich narration can be feasibly equated to such canons of literature… Michelle’s craftsmanship of drawing characters is conspicuously dexterous.